On Saturday, March 1, from 10 am to 12 pm, we will hold our March meeting at the Fremont Public Library in Fremont NH. If you are using Google Maps or GPS, the address is "Jackie Bernier Drive." It is a private drive so there is no street number. Remember to bring your Converging Corners block (plus $1 per block lottery entry) in colors purple and blue, with white solid background fabric. Nancy will also be asking for volunteers to bring snacks and drinks in the coming couple of weeks. Petal Pinwheels MQG Fabric Challenge! 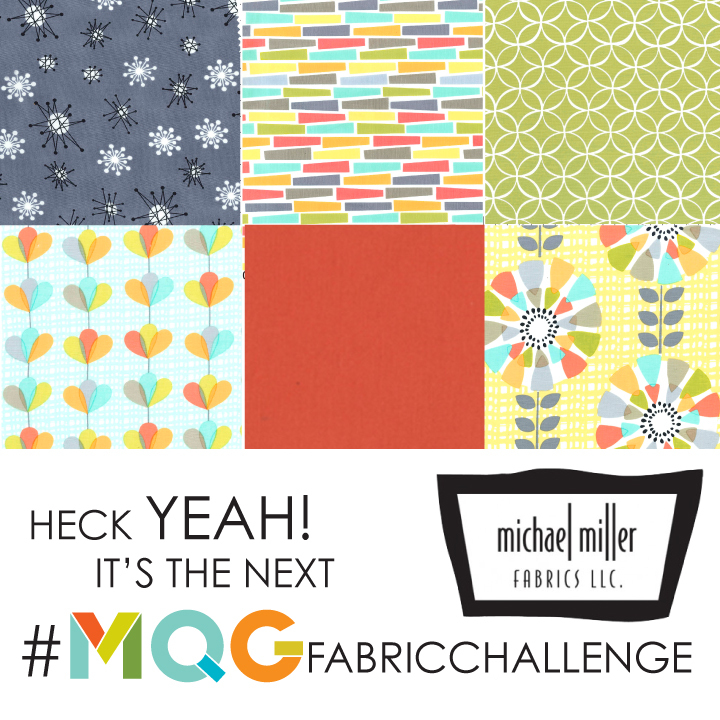 The sponsor for the next MQG fabric challenge is Michael Miller fabrics. The collection, pictured above, is called Petal Pinwheels. Fabric is expected to ship sometime in March. Final projects are due June 23rd, 2014. For those who have completed past MQG fabric challenges, the rules are quite similar: you can add any solids or Michael Miller printed fabric; you don't have to use all the fabrics; you must make something quilted. Are you SEW in? Email Peg by February 26 to request your spot in the challenge! For complete details at the MQG blog (and to see the source of the borrowed photo, above) click here. Our February meeting was held February 1 at the Wiggin Memorial Library in Stratham, NH. Seventeen people were able to attend. Seventeen of us made for plenty of colorful Economy Blocks for the block lottery! Kali was our lucky winner--what a lovely quilt she has started for her. Peg opened the meeting with a few items of business. Riley Blake Challenge photos are due on the Modern Quilt Guild website by February 17. I'm unable to link to the page where you need to post photos because it is a members-only site. However, you will need to 1) log into your Modern Quilt Guild member account; 2) Click the "Forums" tab in the upper right hand corner (Note: if Forums isn't a choice, choose Community, then Forums); 3) Click "MQG Fabric Challenges", right now this is the third option in the list; 4) Finally, click "Sticky: FINISHED Riley Blake Challenge Photos!" You can then hit the "Quick Reply" button and add a photo in your post by clicking the little mountain icon on the far right. Our Lottery Block for next month is the Converging Corners block by Film in the Fridge. Click through to the tutorial! Please make one block per $1 entry. Our chosen color scheme is blues and purples, with white background fabric. 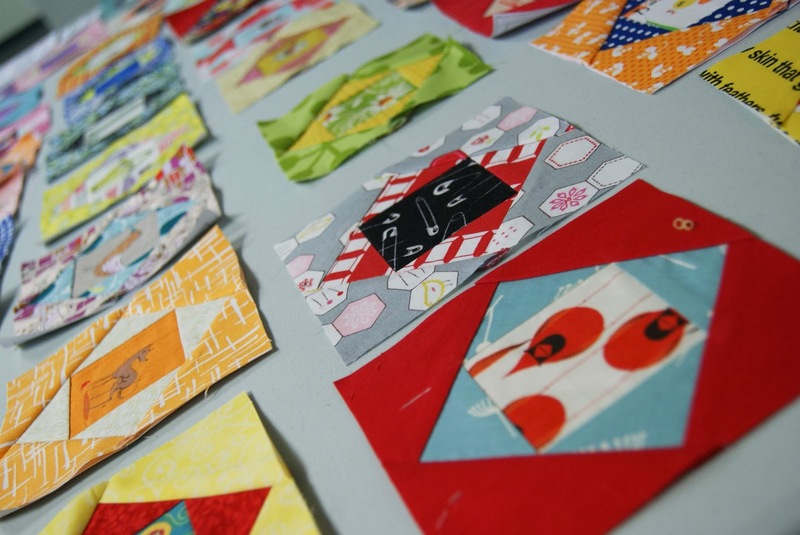 The Northampton MQG has invited us to do a mini quilt swap in the spring. We'll be looking for 10 or so members to swap a mini quilt on a given theme. More information is coming. Payments for the retreat are due by 2/16. Choose your button carefully, and pay here. If you haven't signed up, don't despair, but also don't hesitate--there is one spot left. I'm looking forward to spending a few days sewing with you-all from March 13/14-16! If you're looking to beat the February blues, nothing beats 'em like fabric. (Trust me I know.) On February 20-22 in Nashua, NH, there will be a huge fabric extravaganza at the Holiday Inn. Sew Fresh Fabrics will be one of the vendors! Check out the details at Amy's Facebook page. Finally, one of our upcoming programs will be an improv piecing workshop, run by our own Samantha and Robin, who have taken Denyse Schmidt's improv piecing workshop. They have asked that guild members bring them scraps over the next three meetings (March, April, May). Any size, shape or color will work! For our Show and Tell this month, we showed only Riley Blake Challenge projects. Laura's is a quote from The Little House on the Prairie. Judy attempted--and succeeded at!--her first paper-piecing and made this cheerful tote bag. Nancy made a Noodlehead purse pattern, using pieced and quilted panels. I know this bag would drive away any winter blues I have! Debbie says this piecing made her brain hurt. Maybe it hurts the brain but it is easy on the eyes! I think she said this is destined for a pillow top. Robin made some Tula Pink City Sampler blocks and set them improv-style into a quilt. Stephanie's Showstopper mini was our guild's winner, by popular vote. She won a copy of Ayumi Takahashi's Patchwork Please! I'm awed by all of her perfect points, and the texture her spiral quilting creates. I also think she chose just the right pink and orange solids in that lower left block. Great work, Stephanie! Diane made a lovely table runner playing off the saying "a line is a dot that went for a walk." She used the yellow dot and made swirls of bias tape that meandered down the length of the table runner. 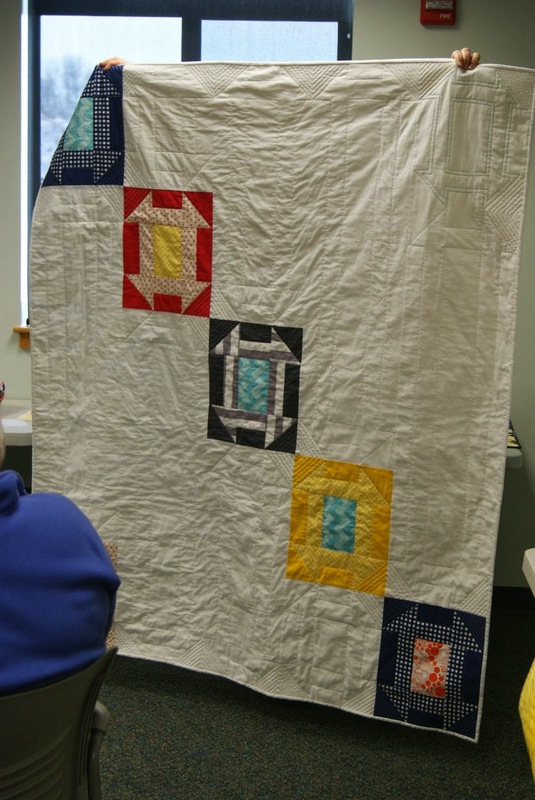 I think her quilting is amazing and deserved to be featured in a detailed close-up! Jess added a lavender and made a sewing machine cover for her antique sewing machine. I admire her bravery in reducing the size of a paper piecing pattern and then readjusting the seam allowances. Wow. Samantha's quilt isn't called "showstopper" but I think it is. I love how striking the colors are against the mid-grey background she chose. The swirl of quilting makes the pinwheels look even more like a swirl. She backed this in AMH flannel and it is a quilt for one of her sons. Beautiful work. Kali made an improv quilt. She says the Kona orange is Tangerine (because I know you want to know--it looks incredible here!). She used up every bit of fabric in a fantastic improv back. 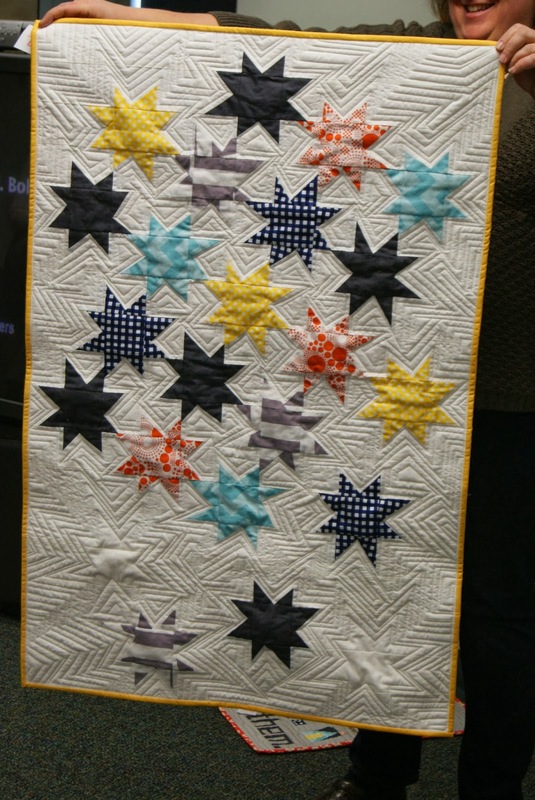 Mary made some improv stars into a mini, and used her walking foot to do some incredibly detailed straight-line quilting. I love how the "missing" stars pop! For our workshop, we watched the Superior Threads DVD Thread Therapy With Dr. Bob. You can see clips of the DVD here. Superior Threads was so generous to donate two $20 gift certificates to be given away as door prizes. Judy and Laura (that's me!) won them. I am paralyzed--in the best way!--by the wide variety of beautiful thread choices offered at the Superior Threads website. Some folks were asking yesterday where Superior Threads can be purchased; they have an extensive online shop here. Hope to see everyone next month at the public library in Fremont, NH. Nancy will be teaching bias binding--I'll have to get a quilt top with irregular edges ready!